A cataract is a clouding of the eye’s naturally clear lens. Vision through eyes with cataracts is characterized as looking through a foggy window or piece of wax paper. Cataracts usually develop as a very gradual, normal part of the aging process, but can occasionally occur rapidly. Many people are unaware that they have cataracts because the changes in their vision are so gradual. Cataracts are very common, affecting roughly 60% of people over the age of 60, and over 1.5 million cataract surgeries are performed in the United States each year. 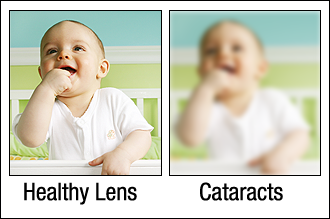 A common misconception is that cataracts are “films” that form over the surface of the eye. In reality, they are actually caused by a natural aging process that occurs inside of your eye. It’s a gradual clouding of the natural lens that over time will make your vision blurry, dull and less sharp. What are some cataracts risk factors? By the age of 65, most Americans will have developed cataracts, which occur when your eye’s lens becomes clouded to such an extent that it affects your vision and quality of life. This condition typically occurs with age, but can also result from trauma, disease, and use of certain medications. Once you have decided to have surgery there are a number of important decisions to make. The first item on the agenda is to select a skilled cataract surgeon. At Stahl Eyecare Experts, we have the most up to date and modern cataract surgery techniques available to our patients. Once you have selected a surgeon it is time to understand what lens implant option will be the best. Before surgery, your eye surgeon will discuss cataract lens implants. How you see after surgery will depend on the lens implant type. Be sure to discuss your lifestyle with our Long Island cataract surgeons to help them understand what implant might be best for you. The intraocular lens is a foldable lens that slides through a tube like a fruit roll-up and unfolds in the capsular bag. 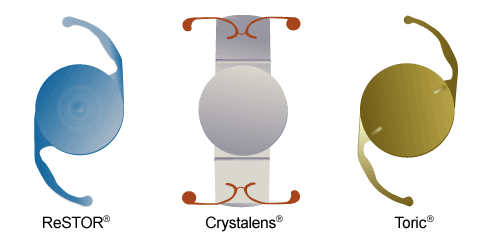 The surgeon may center the new lens with the lens capsule if necessary. Once the lens is centered, the surgery is complete. In most cases no stitches are required to seal the incision due specifically to the 3- millimeter size. This is why it is called micro-surgery by many eye doctors. Having a discussion with your cataract surgeon of choice about the best intraocular lens implant for you is suggested. If you have questions regarding lens implants please feel free to contact our office and we will be happy to discuss your options. Cataract surgery is a two-step procedure—first the surgeon removes your cloudy lens, and second, a new lens implant is inserted into your eye. Before your surgery your eye must be properly cleaned and dilated. A topical anesthetic is used before the small incision is made. An ultrasonic device will be inserted into the small incision to pulverize the hard yellow proteins that form the cataract, and remove them from the eye. It is important that you discuss your vision expectations with your eye surgeon to determine the right premium lens implant for you. The premium lens will be inserted into your eye after your natural lens has been removed. Learn more about the premium lens implants offered at Stahl Eyecare Experts. Patients are typically concerned about the recovery process. Most eye surgeons provide the best quality care and thoroughly explain what you can expect after surgery. Recovery from cataract surgery is generally very quick. Most patients obtain better vision within the first 24 hours of the procedure. Itching and mild discomfort are normal. Some fluid discharge is also common. Your eye may be sensitive to light and touch. If you have discomfort, your doctor can suggest treatment. After one or two days, any moderate discomfort should disappear. For a few days after surgery, your doctor may ask you to use eye drops to help healing and decrease the risk of infection. Ask your cataract eye doctor about how to use your eyedrops, how often to use them, and what effects they can have. You will need to wear an eye shield or eyeglasses to help protect your eye. Avoid rubbing or pressing on your eye. In most cases, healing will be complete within eight weeks. Your doctor will schedule exams to check on your progress. Each person heals differently so it is important to discuss the recovery process with your eye doctor. Complications might include hazed or blurred vision caused by posterior capsule opacity. According to WebMD, fewer than 10 out of 100 people have complications from cataract surgery that could threaten their sight or require further surgery. Our Long Island surgeons welcome you to come in for a cataract evaluation to determine the risks and benefits regarding cataract surgery. Long Island has several options for eye health providers, and there are a wide array of costs associated with cataract surgery. Stahl Eyecare Experts pride themselves on offering a multitude of ways to aid with the cost of surgery. Medicare offers important coverage and benefits for your surgery. Please feel free to consult our Long Island cataract surgeons for information on what is covered with Medicare. For premium, advanced and refractive cataract surgery, additional costs will apply. The experienced cataract surgeons at Stahl Eyecare Experts use the latest technologies, including Catalys Laser Cataract Surgery with Astigmatism Correction, to give their patients customized procedures tailored to their vision needs and lifestyles. Laser Cataract Surgery offers next-generation technology that brings both laser precision and computer guided consistency to cataract surgery. Treatment is tailored to each individual’s vision care needs creating an even better experience for patients and enhancing the accuracy, safety and visual results of their procedure. For years, the femtosecond laser has been hailed as an important step in improving the safety and accuracy of LASIK surgery. Now it has been adapted for cataract surgery to give patients the same advantages, including the femtosecond laser’s ability to deliver a pulse safely and precisely to the exact targeted location. There’s never been a better time for cataract surgery! If you’re suffering from blurry, cloudy, dull vision that just isn’t what it used to be, there’s no need to wait any longer. It’s time to open the door to a bright, clear world and restore your vision and your lifestyle. Call (888) 557-4448 today to schedule an evaluation and take back your vision and your lifestyle.